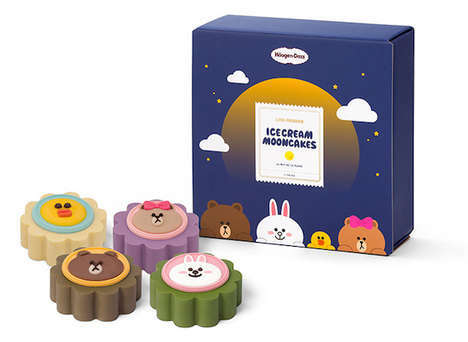 A character-themed box of ice cream mooncakes is Häagen-Dazs Hong Kong’s contribution to the upcoming Mid-Autumn Festival in Asia. For the special product launch, the company partners up with popular messaging app Line and harnesses its aesthetic to create beautiful and engaging dessert creations. The Häagen-Dazs x Line ice cream mooncakes are available in three flavors, including vanilla, green tea, macadamia nut and cream. The box, as well as the bite-size treats themselves, reference the social media app’s adorable characters — Brown, Cony, Sally and Choco. Each box of ice cream mooncakes comes with four pieces, two vanilla-flavored and one of each remaining. Currently, the offering is available online for the early bird price of HK$278 ($26 USD).